The church: St Peter's, Beaufort, South Carolina, USA. The building: The brick building itself is unremarkable, but looks out on Spanish moss-festooned trees. Inside, there is a larger-than-life crucifix behind and above the altar on a deep rose-colored background – awe inspiring! The church: This is the only Catholic church serving a rather vast community – with the exception of a small mission which only offers a Saturday Vigil Mass. I hear tell they're going to be building a larger church soon. The neighbourhood: The grounds of the church and school are very beautiful, with huge live oaks, hanging Spanish moss, a small bridge crossing a pond and many azaleas. It is all very tranquil, although the property is surrounded by heavy traffic. Indeed, it's quite the island of tranquility. The cast: The Mass was celebrated by Father Ronald Cellini. Saturday Vigil, Fourth Sunday in Lent. Mostly half full. We sat close to the front and it was less populated there than at the rear of the sanctuary. We arrived 10 to 15 minutes before Mass and the narthex was empty of any souls. We found some bulletins on a display stand, so we helped ourselves. It would have been better had someone been there to welcome us. As Mass commenced, Fr Cellini asked that we introduce ourselves to each other – nice touch – and during the peace the lady next to me remembered my name (oops, I had forgotten hers!). Standard wooden pews – no complaints, but a cushion to pad the nether regions would have been most welcome! On the whole, the atmosphere was quiet and reverential, and any talk was limited to whispers. The organist was playing quietly. Standard stuff. "Good evening. Welcome to St. Peter's." World Library Publications' Missal and Hymnal, found in the pew pockets, and easy to follow. A good organ played well. Although the pre-Mass atmosphere was, on the whole, reverential, later on, when the congregation went forward to receive the eucharist, one couple in front of us (non-Catholic, I believe) chit-chatted the whole way through. Also, the air-conditioning was turned up so high it was positively bone-chilling. I saw one gentleman turn the collar of his shirt up around his neck in an effort to warm up! It had been a record high temperature during the day and this had probably prompted them to turn up the A/C. Unfortunately, the evening temperature dropped severely after sunset. It was on the conservative side. Fr Cellini made a point of instructing the congregation on the proper way to receive the eucharist. As far as I'm concerned, this was welcome information, in view of how sloppily some people sometimes receive the host. 9  Fr Cellini was an accomplished homilist, but I had difficulty in following, because of his incredibly speeded-up manner of speech. Clearly, his congregation are used to this, but especially when he read the gospel, I had trouble keeping up! The parable of the Lost Son (the Prodigal Son). Actually, it was more about the older son who was upset about all the fuss made over his brother. Fr Cellini pointed out that God doesn't owe us anything, and no matter how well we follow the rules, that's not necessarily going to get us into heaven. The older brother had done everything right, but his bad conduct blew it for him. Actually, the homily was very thought-provoking and made me realize how I would probably have been just like the older brother. I hope I can remember this when I have the tendency to whine! Perhaps the "other place" isn't hot at all – I found the numbing airconditioning almost unbearable! Also, the lack of welcome at the door was disappointing. Hanging around produced no results. Everyone was gone very quickly. By the time we walked outside, Fr Cellini was engaged in conversation with others, so we even missed out on a farewell handshake. If there was any, it was not announced. We went into town and had dinner on the waterfront. 9  Apart from the fact that this is the only church available, I would be happy to make this my regular church. I could even learn to love Fr Cellini's speed-reading! Oh yes, I'm always glad to be a Christian. 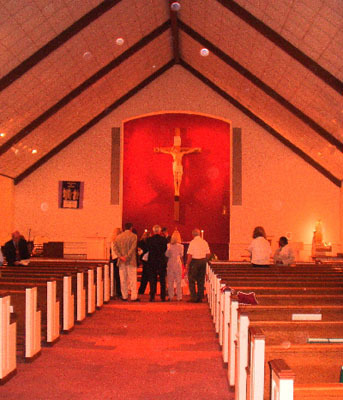 Probably the homily, and the vision of that huge crucifix behind the altar.